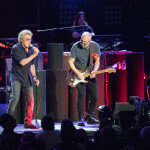 Last night, I was treated to “The Who at 50” at Staples Center. Now this is what a rock concert is supposed to look and sound like, somewhat. I’ll get to the highlights of the show in a second, but let’s deal with the “somewhat” aspects first and indulge in a little Q and A, shall we? Q: What’s the difference between a Dodgers game and a classic rock concert in Los Angeles? A: The Dodgers game is slightly less predictable, and the rock concert has better groupies and sound. The differences sort of fade at this point, however. Both events have aging, overweight attendees who make seemingly continuous trips to the bathroom. It’s kind of like a game of musical chairs except when the music stops, everyone still has a chair. I shouldn’t complain, I got a great workout last night with the constant up and down in my seat. Maybe the venue should (gasp) stop selling beer, perhaps switching to Vodka? At least you’d get a better buzz and there would be fewer bathroom runs. Speaking of the aging crowd, I think Staples may need to adopt the policies of the airlines in that if your bulky frame extrudes past the arm rests, you need to pay for two seats. I have never seen such a large collection of overweight fans in my life. Did everyone switch from reds and blues to Lipitor? Methinks so. I’m left wondering when they are going to create a “premium” section consisting of La-z-boy recliners. 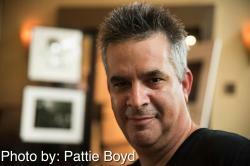 But don’t skewer me for my weight-related barbs, I’m one of those aging overweight fans too, it takes one to know one. So yes, there was actually a show last night, and it had all of the elements of a rock show, but with a much more modern feel to it. Why shouldn’t it have a more modern feel? It’s both a good thing and a bad thing at the same time, but mostly good. I refer to the sound and the visuals. The sound last night was crystal clear, had a perfect volume, and had none of the old echo that we remember. 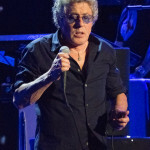 The Who seems to have gone to great lengths to make the sound of their show as pitch perfect as possible. 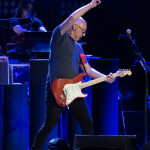 They have some top-notch musicians on stage with them; Zack Starkey on drums, Pino Palladino on bass, Simon Townshend on guitar. Pino is a perfect replacement for John Entwistle as he also stands there pretty motionless throughout the show, although he does bring it. He is one of the world’s greatest bass players. 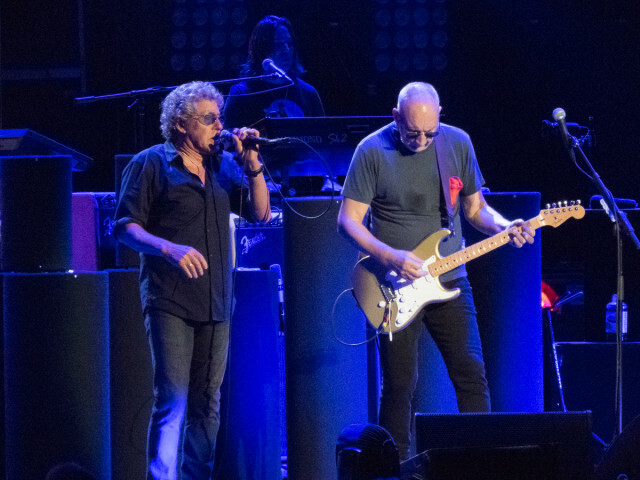 The last time I saw The Two (I mean The Who) was almost 35 years ago in what was supposed to have been their final concert, ever. That was in 1982 at Maple Leaf Gardens in Toronto, and it was at that time quite the event. The band had stated that “this is it, this is the final concert”. That lasted long… But mostly, it was well worth the wait. How many bands have you seen that have actually gotten better over the last few decades? The Who is one of them. Gone was the muddy sound, blocked views and thick clouds of smoke (I’ll get to that). This is after all to be expected, it’s not 1982 any more. This was a much different band, although I can’t be sure exactly when this quantum shift occurred. 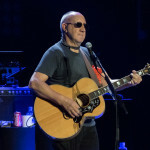 Pete is so engaging now, he speaks at length to the audience, introducing the songs, giving insights into the origins of the songs, and even praising Roger. Maybe Hell has frozen over, who knows? The supposed hatred between these two is legendary, but last night they looked and sounded like old mates, and it’s great to see. 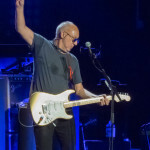 Roger is playing a lot more guitar than he used to, which is fitting as he was the original lead guitarist in the band prior to Townshend joining. The visuals behind the band are a big part of the show. 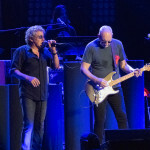 There are vignettes from Tommy, animated bits from The Who By Numbers, and various other clips that basically give you a history lesson on the band, the world, and the band’s role in all of it. Pete’s guitar playing is spot on this tour, whether he’s playing acoustic, or windmilling furiously on his Strat. I still wish he’d switch back to a Les Paul, but I don’t think his (or our) hearing could take that. The setlist is great, all the hits (four according to Pete) that you’d expect. There are mini sets from Quadrophenia, Tommy, and the early years. 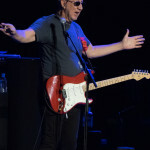 “Eminence Front” sounded so fresh, it was like it was written yesterday, I’m glad they keep that song in the rotation. One part of the banter I could have done without is the tag-team complaining by Pete and Roger regarding the pot smoke at the front of the stage. Roger complains that people shouldn’t be smoking weed at a rock concert, while Pete adds that smokers should just “stick it in their asses”. This has played out at so many Who shows, you’d think that maybe they would just put a big fan on the stage to blow the smoke back toward the audience. Maybe they’re trying to start a new wave of rebellion? Anyway, if you have the chance, you’ll definitely want to see this show. Aging audience aside, it seems like we’ve all aged over the years and the band has stayed the same. And that’s exactly how I like my rock stars! 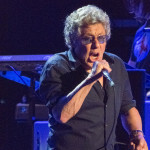 This entry was posted in Events, Music, News & Sports and tagged Classic Rock, The Who. Bookmark the permalink. I for one, would attend many more performances were I guaranteed a La-Z-Boy. it’s a great idea. i might just pony up for that!